Immigration Lawyer New York City: Who Can Handle Your Case? Due to the current state of the country, becoming an American citizen and applying for immigration and even nonimmigrant visas has become a difficult process. It’s even more necessary that you hire an immigration lawyer. Previously, it was difficult to obtain a visa, but with so much fear surrounding xenophobia and Islamophobia, more people are on high alert. 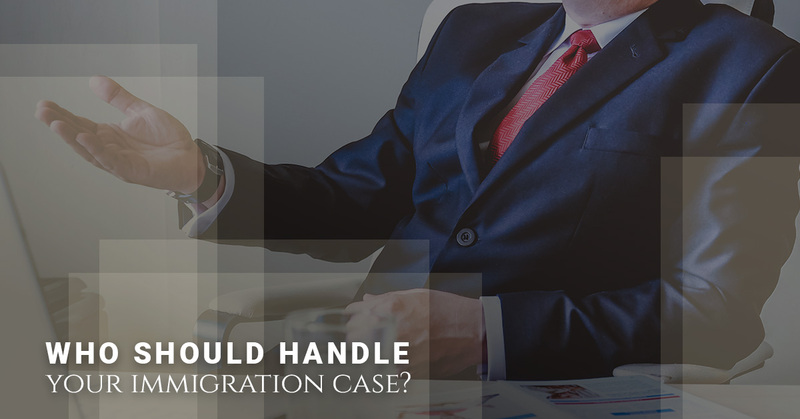 In today’s blog, we’ll be addressing the question of who should handle your immigration case? In our above video, we touch upon an unlicensed paralegal handling your immigration case. We’ll go over in more detail who should be handling your immigration case and why. In case you haven’t figure out who should handle your immigration case, it’s a lawyer. They have the most experience and knowledge in the specific area. If you already know that you want to hire an immigration lawyer, then contact us for a consultation today. We deal with everything from immigration to nonimmigration visas. The very first reason as to why you should hire an immigration lawyer is because it speeds up the process of obtaining a visa. As we mentioned above, it’s a difficult process. If you just fill out one section of the application wrong, then you can be denied. Hiring an immigration lawyer will help you go over the paperwork, understand the process, and ensure that the procedure is smoother. An immigration lawyer can provide legal advice, help you figure out the best visa for you, and if you have any prior convictions, then he or she can also represent you effectively. If you want to fill out your application correctly the first time and go through the process faster, then you should hire an immigration lawyer to help you through the procedure. When it comes to applying for a visa, you have a few options. You can do it yourself and filter through the paperwork while hoping for the best outcome. You can also employ an immigration lawyer. If you’re serious about wanting to stay in the country or if you want to bring over someone to the United States, then hiring an immigration lawyer is the best option. If you don’t appoint an immigration lawyer, you can be looking at some risks for your case. For example, you could be looking at a very long processing time for your application. Instead, by appointing a lawyer to your case, you can save yourself four to eight weeks. Another risk is that you apply for the wrong visa. For instance, if you’re a musician and you want to come to the United States with your family you might not know to apply for the O-1 visa. You might apply for a visa that’s focused on bringing your family members over instead of one that’s specifically for performers with families. Another risk of not having an immigration lawyer handle your case is that you might not be up to date on all of the changes in immigration. The immigration lawyers at Zohar Law PLLC are all very knowledgeable about the changing policies of immigration. You might not know all there is about what’s changing for immigration in the United States. An immigration lawyer will lower your risks for achieving citizenship or a temporary stay in America. He or she will know all of the current immigration laws and how to push through your application in a quicker manner. Furthermore, they are aware of the types of visa that would be the best option for you and your family. Simply put, an immigration lawyer will walk you through the process of the case without any hiccups. He or she will also know what to do if your application is denied and how you should proceed. If your situation is more unique, such as you’ve been deported, you’ve committed a crime, or you want to get a divorce, then they’ll know how to handle the situation in an expert manner. Our goal at Zohar Law PLLC is to help you achieve your dream of staying, visiting, or temporarily living in the United States. As a Top Rated Local® Legal Service, we’ll walk you through what you should expect in your particular case. We don’t choose a one-size-fits-all approach, but one that’ll meet your expectations for the best possible outcome.